Where do you currently store your bike? Where do you WANT to store your bike? As the City of Portland continues its work to reach 25% bicycle mode split, have you ever wondered where all the bikes will park? 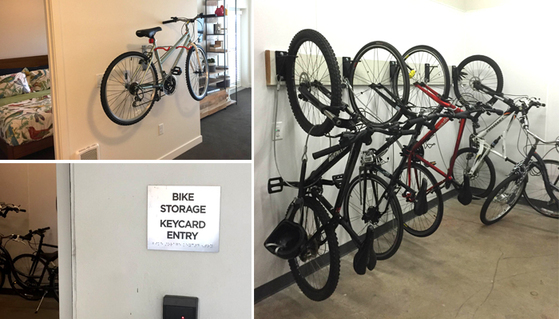 We’ve seen the public, blue staple racks along the right-of-way, but what about the office worker – where do they park their bike for the 8+ hours during the work day; or what about people who live in apartment buildings – where do they store their bikes every evening? The Portland Bureau of Transportation (PBOT) is currently in the middle of reviewing and updating the Bicycle Parking code requirements to ensure the provision of adequate, comfortable, accessible and secure bicycle parking for new buildings and major redevelopment throughout Portland. The current text of the Bicycle Parking section of City Code (Chapter 33.266 Parking and Loading) was largely written and adopted in 1996 [there was a significant update in 2004 for short-term bicycle parking; and in 2010 to update the amount of required long-term bicycle parking spaces for multi-family dwellings]. PBOT has convened a Stakeholder Advisory Committee to help guide the process and address key issues around short and long term bicycle parking in new buildings. While the committee is grappling with a number of key issues, one of the current focus areas is on apartment/ multi-family dwelling bicycle parking, and specifically how and where to provide long-term, secure bicycle parking for residents. We have developed an online community survey regarding apartment bicycle parking, because, at this time, the Stakeholder Advisory Committee doesn’t feel that it has enough user input on this topic. The survey addresses questions regarding the types of bicycles people own, where they are able to park their bicycle (long-term, secure), and their personal preferences for bicycle parking. A popular statement is that, “Portlanders love their bicycles so much that they want to sleep with them as close by as possible.” While there might be some truth to that statement, we want to hear from users about their issues with bike parking and where they would prefer to store their bicycles. The results of the online survey will be used by PBOT and the Stakeholder Advisory Committee during the code update process. Want to know more about bicycle parking in Portland? Click here for more info on all of PBOT's bicycle parking programs and services.